Delicious homemade Cabbage Patch soup with kidney beans. Hamburger and cabbage team up with kidney beans and lots of flavorful additions to create a healthy meal for your family. Quick and easy Dairy-Free, Gluten-Free dinner. Over the thirty plus years we’ve lived in our neighborhood we’ve made many friends. We have wonderful memories of LOTS of block parties with our neighboring families. When our kids were growing up they engaged parents, grandparents and friends as the audience for their plays. They wrote, produced and acted out many plays all by themselves. Various neighbors hosted these events. We were all quite proud of our kids for their theatrical accomplishments. But we needed more than amature theater hour to keep us coming back. The parents insisted on a Food table and time to catch up on the neighbor news afterward. This cabbage soup recipe came as a gift from a neighbor friend at one of these events. We all wanted this recipe! It’s such an easy cheap party food. Is VERY GOOD! Our recipe originally came from Snohomish Washington where our neighbor was raised. This soup is so popular you can find it by googling Cabbage Patch Soup Snohomish! Our family loved this recipe for decades. It is time tested and approved. Basically, Cabbage patch soup is a hamburger soup with vegetables. LOTS of healthy vegetables like celery and onions and of course a boatload of cabbage. Our recipe also has red kidney beans. That ups the carbs but also the food value. 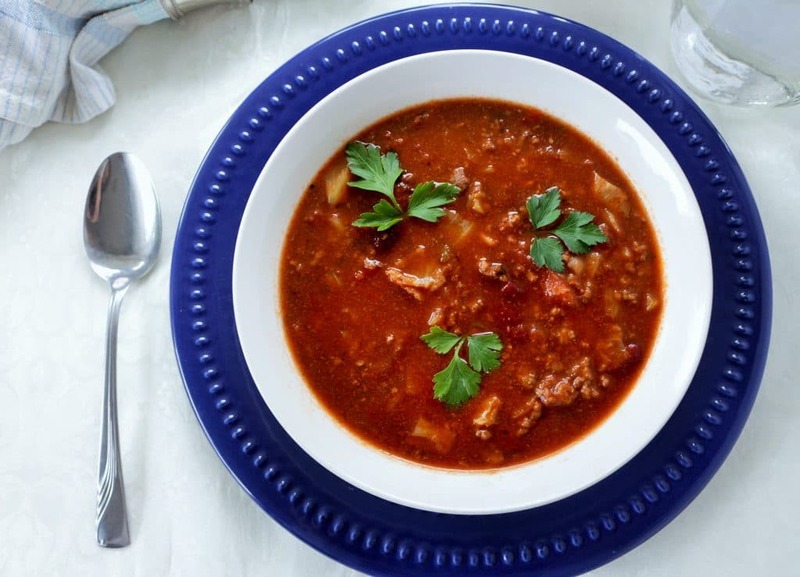 This healthy hamburger soup recipe also uses LOTS of yummy flavor add ins to keep it interesting. Like Chili powder and beef broth (OR vegetable broth). I’ve used chicken broth in a pinch but beef broth is more appropriate for this hamburger soup base. Cabbage Patch Soup with kidney beans. Full of healthy fiber. Cabbage is incredibly good for you. For every cup of cabbage you are only getting 22 calories. But they are loaded with nutrients. No wonder a soup diet was created with cabbage. According to Healthline cabbage is a powerhouse of good for you fiber, antioxidants and vitamin B6. Not to mention many other vitamins to nourish you at the end of your day. We should eat more cabbage in our diets. Love Cabbage? If you are Looking for more healthy cabbage recipes Here are some Delicious recipes full of cabbage. You may be familiar with the Cabbage Soup Diet. This recipe started out as part of that diet. Eventually the diet was debunked as a fad. Eating cabbage soup recipes for a week to lose weight really isn’t that great a diet plan. Especially at weeks end when all those goodies are waiting for you. Cabbage soup is very good for you but not a complete food. This soup is actually a higher carb version of the original I found out. So this cabbage soup has MORE food value and is still very low in calories. When I was given this soup recipe I had NO IDEA it was part of the cabbage soup diet. We just really love it. The diet may have failed but this soup recipe is a definite success! Our Cabbage Beef Stew is another winner Dinner. If you love cabbage this recipe is delish too. 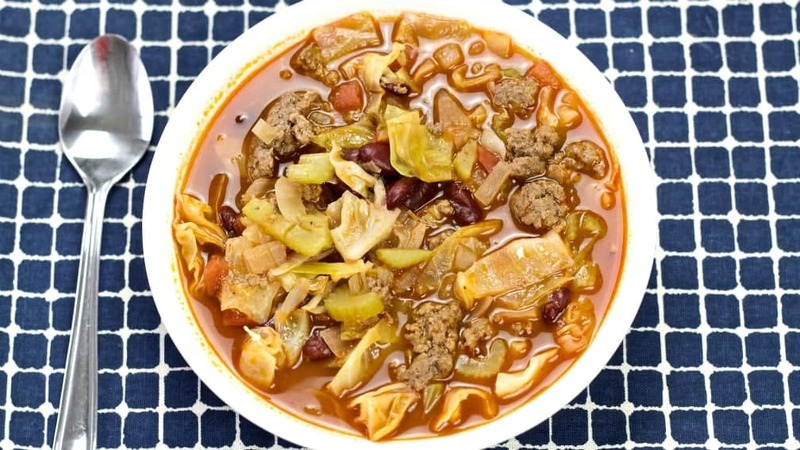 This beef cabbage soup is a favorite gluten free soup. I make this great recipe all the time. It’s easy, delicious and nutritious. And very light. 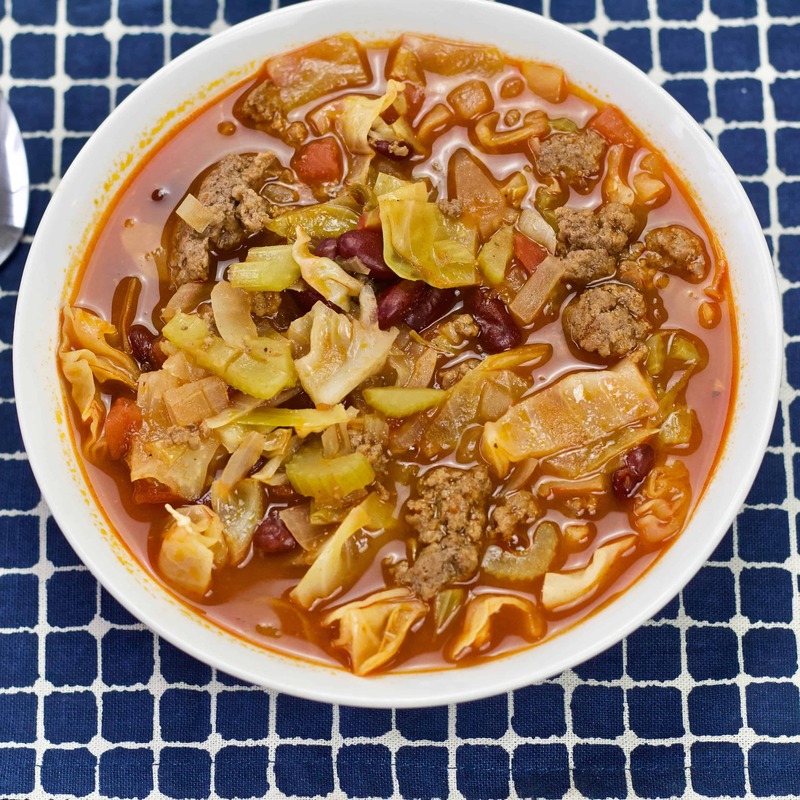 Cabbage patch soup with kidney beans helps increase the soups staying power. Kidney beans are full of healthy fiber and protein to keep you satisfied. You can make it without the kidney beans. But I recommend keeping the beans in this recipe. Kidney beans add healthy carbs to do your body good. You can make this recipe in your slow cooker, instant pot or on the stove. Honestly, it’s such a fast soup the stove top is really the easiest. Brown the meat, throw in your other ingredients and cook for 20 minutes! TIP: DEFINITELY brown the hamburger first. Then load the crockpot with all the other ingredients and set it on high for four hours. It won’t hurt you to use raw hamburger in the slow cooker as long as you make sure it’s completely cooked before you eat it. THE REASON for browning the hamburger before you make this soup is to enhance the flavor and texture of the meat. 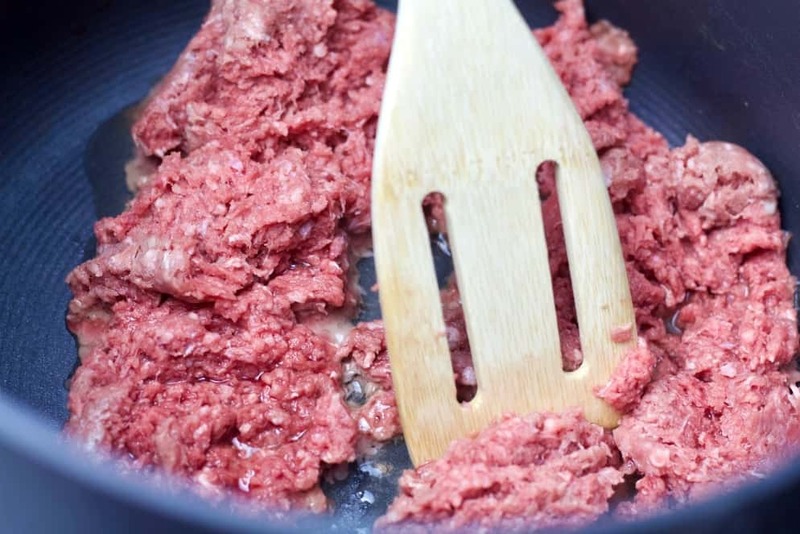 DON’T throw raw hamburger into the crockpot (OR stock pot OR instant pot) and cook the soup. The meat will be mealy and flavorless. Cabbage patch soup fresh vegetables. Onion, celery and cabbage. LOTS of cabbage. Put a large soup pot on the stove and have dinner in 30 minutes! Brown hamburger, celery and onion in a large soup pot. Add remaining ingredients and allow to boil gently for 20 minutes on medium high heat. Simmer the soup up to two hours to improve the flavor. But this soup can be served within a half hour of making it. If your hungry dig in! Makes great leftovers! 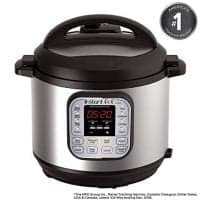 Of course you can make soup in your instant pot too. Start the saute function and add the ground beef. Let it brown a bit and add the celery and onion. Add remaining ingredients and use the soup function set to 20 minutes to cook it. This Cabbage soup with hamburger is especially good with dinner rolls or french bread. That’s all you need for a filling healthy meal. Need a sugar free, low carb, gluten free dessert? Try our Sugar free Pumpkin cheesecake. Delicious homemade Cabbage Patch soup! Hamburger and cabbage team up with kidney beans to create a filling, healthy meal for your family. Quick and easy High-Fiber, Dairy-Free, Gluten-Free dinner. Simmer the soup up to two hours to improve the flavor-but this soup can be served within a half hour of making it. For the crockpot: Brown the hamburger separately, then load all the ingredients into the crockpot. Set it on high for four hours. Serve. I Never drain my canned beans or other canned ingredients when making this soup (or any of my soups). 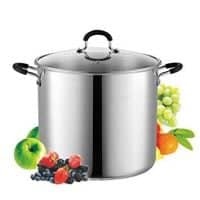 I actually pour the canned contents into the pot or crock and then rinse the cans and add that water too. I don't mention that in the instructions because you can adjust the soupiness to taste. 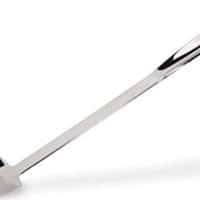 For best flavor use water sparingly. Want more soup recipes? We love soups! This post was originally published September 28, 2014. It has been updated and republished with new pictures and video. Previous Post: « Chicken Alfredo-Low Carb and SO easy! What a comforting soup for fall, I just love the cabbage in there!! What a delicious, hearty soup! Definitely a meal packed with flavors and aromas! What a fab soup idea – warming and comforting too. What a healthy and hearty soup that’s perfect for the colder days! Yum!!! This is a very comforting soup. This is the kind of soup we look for when the temps are dropping, a hearty and delicious soup to warm our soul. This is an all time favorite at our house Joanne. I make it all the time in the cold months! Such a hearty and warming soup, and what a lovely community you live in! Thank you elizabeth. We are so fortunate in our neighbors. 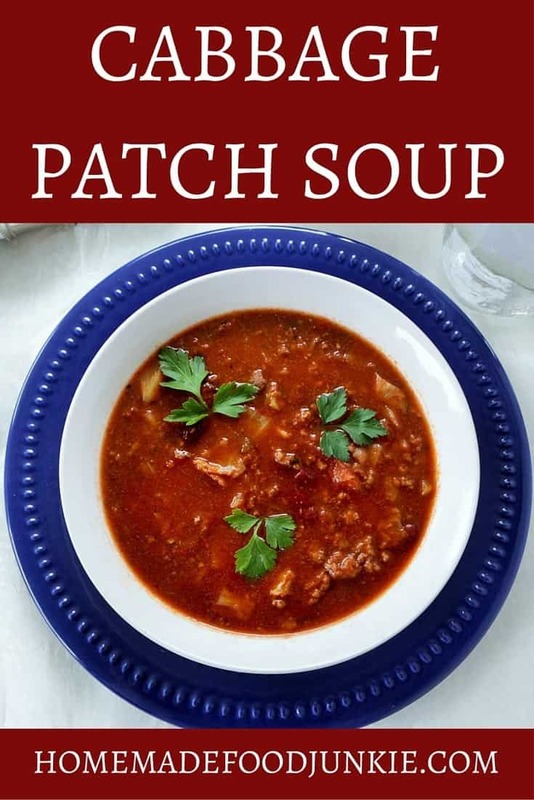 We loved raising our family here and we love this soup! This recipe makes about 6 large bowls (2 cups or more). Thanks for your question and we Hope you love it! As someone who’s moved a lot over the years I envy your strong neighborhood ties & friendships! So wonderful to have those community connections. The soup sounds so wholesome and comforting – perfect for a potluck! Thank you April. We do love those strong bonds with our neighbors. So much history we share with them!This soup is just one of the many blessings of those good times! Amazing! I almost make the same, but without meat! I’m going rethink that option, this looks so delicious. You’ll love it made this way as well, Tina. This soup has stood the test of time. our family has love it for decades! This recipe is a keeper. I used Spanish sausage (chorizo). It was tasty and healthy. Thank you for the kind feedback Maria! I’m delighted to hear you made Cabbage Patch Soup and enjoyed it. Thank you for the recipe idea as well. Sausage is a great idea for this tasty soup!